In the local Tonga dialect, Zambezi River means “Great River.” Being the fourth longest river in Africa, flowing 2700kms through six countries on its way from North-Western Zambia to the Indian Ocean, it is undoubtedly one of the best white water rivers on the face of the planet and yet very soon it may all be gone. the take out point. The river drops about 400ft over the 56km covered during this three day three night adventure and the depth of the river can reach 200ft. The British Canoe Union has classified the river Grade 5 “extremely difficult, long and violent rapids, steep gradients, big drops and pressure areas”. Nearly half of the rapids negotiated are Grade 5. Transfer from either Livingstone International Airport in Zambia or the Victoria Falls International Airport in Zimbabwe to the Victoria Falls Waterfront. 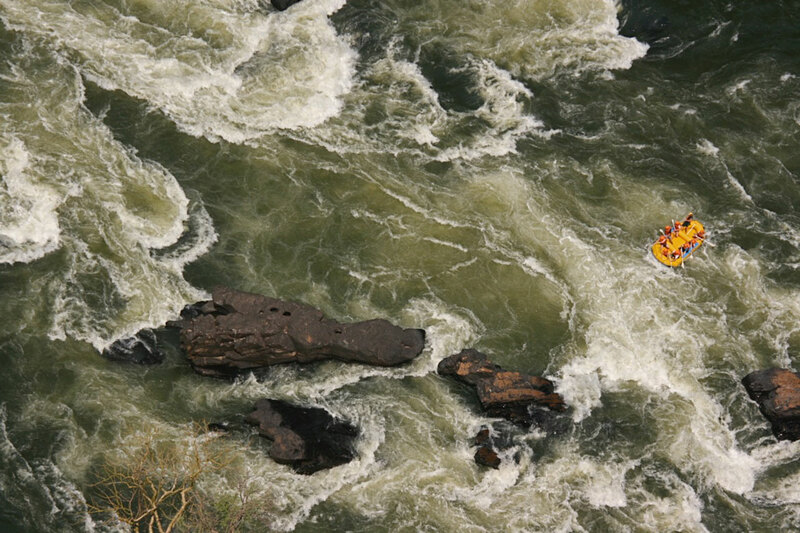 Situated on the banks of the mighty Zambezi this is well known to White Water Rafters and paddlers worldwide as the “place to be” in Livingstone. Accommodation tonight will be in Twin Share Chalets. Following a brief from the Trip Leader its time to board another of Livingstone’s highlights in the form of the MV Mukumbi “Sunset River Cruise”. With a braii being served on board its time to chill out and enjoy the view whilst taking a beer or two!! Overnight – Victoria Falls Waterfront. After a short paddle we reach our first portage of the day before joining our rafts again to paddle below the mighty Victoria Falls. 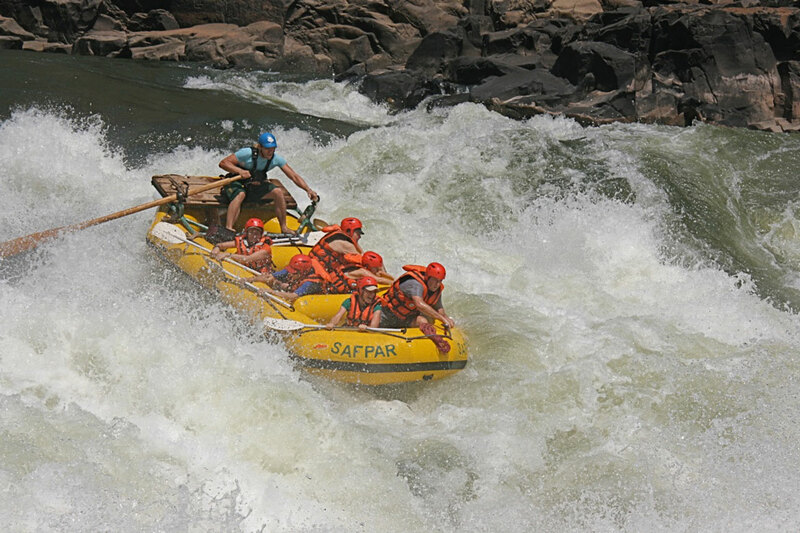 Known locally as the “Minus Rapids” and due to time constraints not normally visited by the commercial “One Day” rafting trips this experience is second to none, visited by few it is undoubtedly one of the most dramatic spots you will encounter. Here we have time to explore the surroundings, enjoy a light lunch, before packing up to experience the sheer thrill and adrenalin rush of what is the best white water rafting the world has to offer. En route to our Overnight camp at rapid #10 you will be tested by class 3 – 5 rapids with names such as “Morning Glory”, “Stairway to Heaven”, “The Devils Toilet Bowl” and the “Mighty Muncher” before our second portage of the day around the class 6 rapid #9. Arrival in camp at rapid #10 brings a well-earned rest, with plenty of time to chill out over a nice cool beer andreminisceon what will have been an adrenalin pumped day. As the light begins to fade and the aroma of a freshly cooked dinner takes over the Batoka Gorge is all ours. As Africa awakes to the sounds of Fish Eagles eager to start the day, we are again in no hurry as time is on our side; this is another chance to capture the beauty that is the Batoka Gorge whilst enjoying a hearty freshly cooked breakfast with plenty of time for that extra cup of coffee!! After breakfast its time to prepare our lunch for the day, pack up again ensuring we leave minimal trace of our overnight camp before continuing on our journey along the mighty Zambezi River. The section of river covered today is a little less challenging than Day 1. Rapids tend to be a little more forgiving or so the river leads us to believe as the air of tranquillity is soon broken by the sounds of the “Three Ugly Sisters” closely followed by the “Washing Machine”, “Terminator 1 and 2” and wait for it rapid #18 “Oblivion”. Lunch today is a relaxed affair as we gently float downstream, en-route to our second night’s camp at rapid #21. It’s soon time to set your tent up, or even fall asleep on the beach beneath the stars for yet another unforgettable evening in the Batoka Gorge. After another freshly cooked breakfast, and yes time again for that extra cup of coffee, we break camp, prepare lunch and set off to our final destination the stunning Lower Moemba Falls. ‘Chamamba Falls’ and ‘Upper Moemba’ to mention just a few. As the gorge opens up today we may get the chance to glimpse at some wildlife, such as crocodiles and klipspringers plus a vast array of birdlife. Upon arrival at Moemba Falls we enjoy a relaxed lunch, whilst exploring this remote area. It’s soon time to set your tent up, or even fall asleep on the beach beneath the stars for our last unforgettable evening in the Batoka Gorge. But like all good things it has to come to an end sometime, after breakfast its time to muster up all the energy we have left before we begin the 750ft hike out of the gorge. 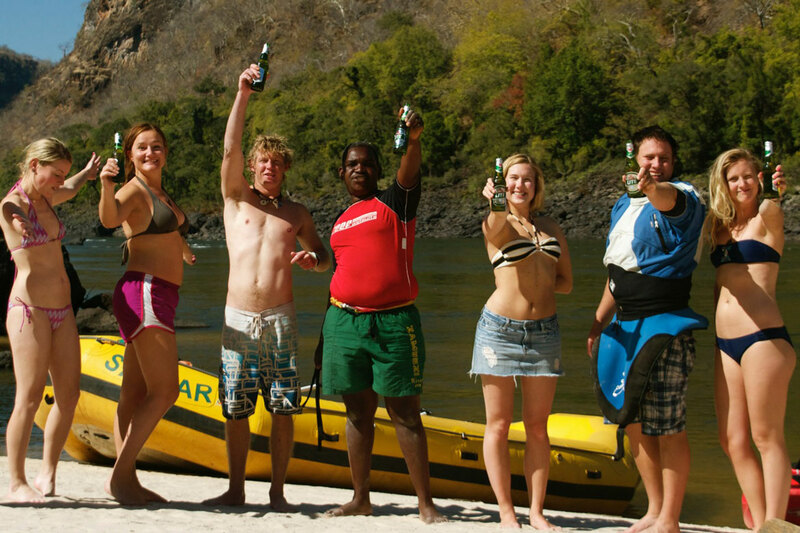 Salvation comes quickly in the form of Ice Cold Beers and soft drinks waiting at the top, and its time to rest, sit back and enjoy a true ‘Grade 5’ road which slowly winds its way back to our River Base at the Victoria Falls Waterfront.